Ever since his accession to the Iraqi premiership in 2006, Maliki’s strength has been the ability to avoid outright showdowns with the Iraqi parliament despite persistent and growing frictions. In some cases, this has been done simply by letting parliament quarrel among themselves regarding key legislation whereas Maliki governs based on Baath-era laws: The oil and gas law is a case in point. In other cases of problematic legislation, Maliki has relied on the judiciary to strong-arm the national assembly into obedience. This approach proved itself successful in a number of cases – and perhaps most spectacularly so when the supreme court struck down early attempts to decentralize the provincial powers law in 2010, as well as in Maliki’s moves to attach the independent commissions administratively to the executive and to limit the right to question ministers. And again other potential conflicts have been defused in the last minute by the resuscitation of sectarian alliances, sometimes with reported Iranian support. First, there was of course the last-minute détente with the Sadrists that largely helped save Maliki’s premiership in early summer 2012 when things almost reached a critical level. As late as January this year, only months before the provincial elections, Shiite parties similarly sided with Maliki and failed to attend an emergency session of parliament intended as a show of support for growing political unrest in Iraq’s provinces. In sum, whereas Maliki is dreaming a lot about rather unrealistic visions of a “political majority” government, he has actually been quite successful in surviving with what is often not the “power-sharing” he posits as the lamentable reality, but rather a “political minority” government. There have of course been exceptions, i.e. votes that were lost for Maliki or turned out in ways that were antithetical to his vision for Iraq. At the first such vote, the October 2006 law on the formation of federalism, one could argue that the Daawa had not consolidated its parliamentary base in any shape or form, and incongruously ended up supporting legislation which it would later bitterly oppose. Perhaps the most serious losses was the ascendancy of Ayyad al-Samaraie to the speakerhip in 2009, which was vigorously contested by Maliki but to no avail. More recently, Maliki twice tried to influence the formation of the Iraqi electoral commission – first by prematurely attempting to sack the incumbent one in July 2011, then by a failed attempt at inflating the number of commissioners in 2012. This was a harbinger of more serious things to come: Term limits on the premiership in January 2013, and provincial powers law revisions in June. There are reports Maliki allies are challenging some of these laws before the supreme court (and he may potentially have some success with the limitation of the premiership terms) but so far no clear decision has emerged. Earlier this week, on 22 July, another such milestone for the critics of Maliki was reached. In a parliament session attended by no less than 243 deputies, a proposal to confirm the Sadrist Falah Hasan al-Shanshal as de-Baathification head was approved. Details on the vote are few, with some sources claiming “unanimity” and others suggesting some Maliki allies rejected it. Whatever the actual voting patterns, Maliki supporters have already indicated that they may once more complain to the federal supreme court. The really important point though is that according to the accountability and justice law, the decision on the head of the de-Baathification committee must be made by an absolute majority, i.e. 163 out of the 325 parliament members. We must assume the decision was made in this way, and that an absolute-majority opposition to Maliki is beginning to consolidate in the Iraqi parliament. That is a threatening proposition even to a prime minister who has expertly sidelined the assembly in the past. Going forward to the parliamentary elections of 2014, he must especially be wary of the burgeoning coalition of Shiite Islamists (Sadrists and ISCI) and Sunnis/secularists (the Nujayfi bloc in particular) that reportedly pushed forward Shanshal’s approval. Beyond the numbers, there is the strong symbolism of the personalities involved. Shanshal, of course, was sidelined by Maliki earlier this year after having attempted to remove Midhat Mahmud – the supreme court chief and a key Maliki ally in his efforts to keep the Iraqi parliament at an arm’s length. Now Shanshal is being reinstated, suggesting more criticism of Maliki’s regime of the deeper kind focusing on his relations with the judiciary could be coming up. On a more humoristic note, the abnormally high attendance rates in the Iraqi parliament in July, in the middle of Ramadan, raise some questions about what is going on. Could it be related to superior provision of air condition at a time when most other Iraqis suffer in the 50 degrees Celsius heat? Surely, if the trend continues like this, the assembly might actually get things done, which would be a welcome change from the recent past in Iraqi politics. 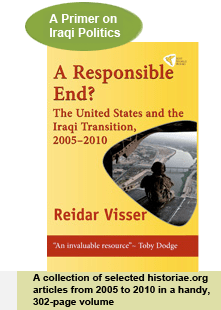 The Iraqi Factor in the Syrian Crisis: Catalyst or Inhibitor? Iraqis who cast their votes in postponed local elections in Anbar and Nineveh on 20 June had a lot on their plates. Beyond issues relating to the provision of services locally, the last weeks before the elections saw massive protests against the central government in Baghdad. The many angry slogans on display included calls for greater autonomy for the Sunni-majority areas of Iraq as well as expressions of solidarity with the mainly Sunni Syrian opposition movement. Some commentators even suggested momentum was building toward an “unmaking of Sykes-Picot,” the World War One British-French agreement that significantly impacted the delineation of borders between the modern states of Iraq and Syria. In terms of comparison with the rest of Iraq, it is clear that politicians in Anbar and Nineveh are struggling in terms of building relationships with their voters. Despite running in the most populous governorate after Baghdad, politicians from Mosul and Anbar mostly fail to make it into the top 15 list of the best vote getters nationally. The five exceptions are Nineveh governor Athil al-Nujayfi of Mutahhidun (40,067 votes), the two top Kurdish politicians in Nineveh (14,218 and 13,672 votes respectively), ex Nineveh governor Ghanem al-Basso (12,716 votes), and Anbar governor Qasim al-Fahdawi (14,503 votes). Additionally, beyond national comparisons, it is clear that for some of these politicians, personal vote numbers that may come across as decent actually look worse when compared with results in the previous local elections of January 2009. This is above all the case with regard to Nineveh governor Nujayfi. Reflecting his party’s stunning loss of more than 300,000 voters since 2009, his own results declined from around 300,000 personal votes to only 40,000. And whereas it is clear that Mutahhidun has done a good job nationally in terms of transforming the original Hadba party in Nineveh of 2009 to the dominant force within the Sunni and secular camp from Basra to Diyala, the reversal of its fortune in Mosul itself may suggest that Athil al-Nujayfi’s governorship of that area may have become something of a liability for his brother Usama’s national ambitions (or, alternatively, that the move towards rapprochement with the Kurds is hurting them more there). It should be stressed that these negative results do not reflect disinterest in the personal vote option among electorates in Nineveh and Anbar. Unlike the results for the other governorates, IHEC has helpfully calculated total personal votes in these latest results. In Anbar there were 404,218 personal votes whereas the total of approved votes was 414,554, indicating a 98% use of the personal vote. Interestingly, in Nineveh there were 596,603 personal votes whereas the total of approved votes is given as somewhat less, 581,449! This could either indicate that the personal vote numbers fail to eliminate dismissed ballot papers (which would suggest the existence of some deeper problems in IHEC’s final ranking of the candidates) or that IHEC has miscalculated in this particular case. In any case, it seems clear that Anbar and Nineveh voters have used the personal vote amply; it is just that the local politicians are struggling to gain the attention of their electorates. With the extreme fragmentation of the vote, it is not really worth commenting on the coalition forming process pending certification of the final results which is not yet complete (and before which no new local government can be elected). With the large size of these councils (30-40 seats), the absence of any blocs with more than around 25% of the seats and a plethora of small parties with 1-2 seats, predictive efforts will be mostly useless. For Prime Minister Nuri al-Maliki, the decent result of Governor Fahdawi in Anbar may come across as good news, somewhat similar to what happened in Salahaddin (which voted in another governor who is on reasonably good terms with Maliki). For their part, the Nujayfi brothers will have to sort out the contradictions between their attempts to pose as Iraqi nationalists and their increasing closeness to KRG and Turkey in an attempt to stem Maliki’s growing power – a contradiction that will be highlighted by the fact that the Kurds are the biggest seat winners in Nineveh. At the very least, one can hope that the necessities of building viable local coalitions for the new councils may play a role in preserving a reasonable political climate in Iraq’s northwest. After months of angry protests – some of it in solidarity with anti-Assad forces in Syria – it does seem that local, Iraqi concerns determined the choices of the electorate in the end, and that performance on such concerns will continue to determine the fortunes of the local politicians there in the future.